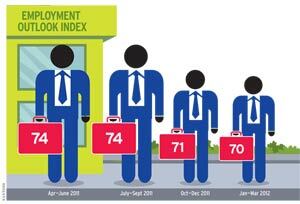 The latest Business Today-TeamLease survey says 2012 is going to be tougher for jobseekers. It has been a tough year for jobseekers. 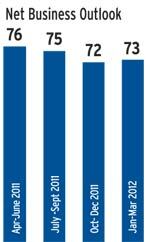 But it is going to get tougher in 2012, says the latest Business Today-TeamLease survey. The overall Employment Outlook Index, or EOI - the difference between the percentage of respondents who expect hiring to increase in the coming three months and those who expect it to decrease - has fallen to 70 for the January to March 2012 quarter, against 71 in the October to December 2011 quarter. That may not seem too worrying, but a look at the last 12-month trends shows that "a bloodbath has already occurred" in certain sectors, as the report puts it. 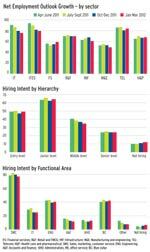 "The mildmannered changes forecast for the coming quarter camouflage a substantial drop in index values across cities and sectors," says the report. In the two earlier quarters, from April to June and July to September 2011, the EOI had stood at 74. The last 12 months' trends show that only three of the eight industry sectors included in this survey of 610 companies - financial services, infrastructure and health care and pharmaceuticals - have seen an improved outlook on recruitment. In financial services and health care and pharmaceuticals, the EOI has risen by three points across the year; in infrastructure by two points. However, if the October to December 2011 and the January to March 2012 quarters are considered, infrastructure has seen a three-point drop in its EOI, from 68 to 65. The remaining five sectors - IT, ITES, FMCG and retail, manufacturing and engineering, and telecommunications - have all seen negative growth or no growth at all. Though the telecom sector's EOI showed a two-point rise, the annual trend has been a two-point fall, from 86 to 84. The EOI for the IT and ITES sectors dropped by four and two points, respectively, between the present quarter's survey and the last one. But the trend across the year is stunning: the EOI for the IT sector has fallen by 15 points, from 91 to 76, while that for the ITES sector has dropped by 14, from 94 to 80. "The economic instability in the US and European markets has had a direct impact on the demand for IT services from India," says Sunil Goel, Director at GlobalHunt India, a human resources, or HR, recruitment company. Goel estimates that there has been a 10 to 15 per cent reduction in the workforce of IT sector since April. "FMCG is one sector that gets hit when other important service sectors don't do well and consumer spending takes a hit," says Sangeeta Lala, cofounder and Vice President at TeamLease. "The FMCG sector will follow a hectic hiring pace in the coming three to six months," says Murali Santhanam, Executive Vice President, HR, CavinKare. "This is a slow period, but from April onwards it will pick up." The BT-TeamLease survey also evaluated business sentiment. The Business Outlook Index, or BOI, the difference between the percentage of respondents who expect business to improve in the coming January to March quarter, and those who expect it to decline, stood at 73, up by a single point from the October to December figure. Across the last 12 months, however, it also shows a three point decline, from 76 to 73.